Located in east Sioux Falls off of 26th Street (near HWY 11). Streets in this development include Villa Ridge St. and Foss Ave. Located in west Sioux Falls off of 22nd St and the Tea-Elis Road. Streets in this development include Wheatland Ave., Monroe Place and President Ct. (on the north side of 22nd St). Located off of Sycamore Avenue, south of 57th Street. 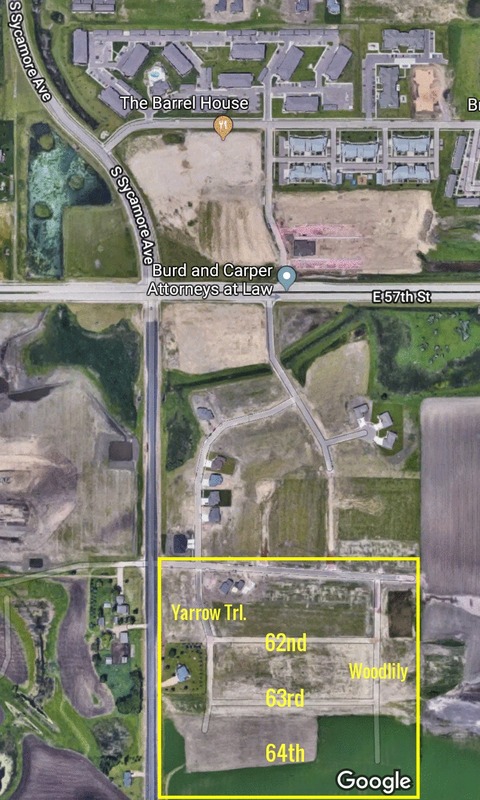 The streets in this development include Yarrow Trail, 61st Street, 62nd Street and 63rd Street. Single-Family Homes located in SE Sioux Falls. The streets in this development include Badlands Avenue, Badlands Ct., Prairie Wind Street, and Vineyard Ave.